We have a State Champion! Long Course USA Swimming State Championships took place July 26-29. 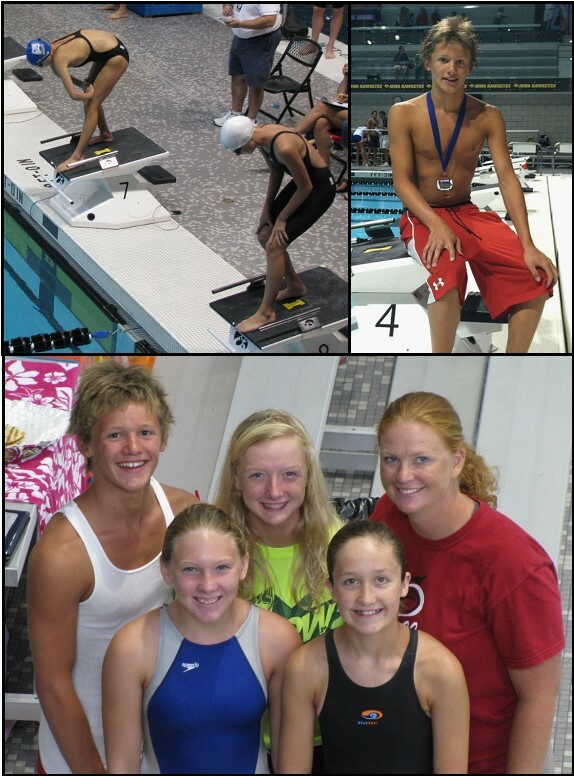 The Pella Swim Club had 7 athletes qualify and 4 attend with Head Coach Jennie Hedrick-Rozenberg. As Pictured (Isaak Webb age 14, Samantha Hedrick age 14, Head Coach Jennie Hedrick-Rozenberg, Alexis DeVries age 12 and Madeline Webb age 12). Upper Rt. (Samantha Hedrick competes in the 13/14 100 Breast as she steps up to the blocks, Lauren Clingman from Knoxville is pictured just to her right). Upper Lft (Isaak Webb with Gold Medal he earned in the 13/14 boys 100 Breaststroke). Isaak and Samatha both have achieved AAA time standards in a number of events and will be competing against 7 other states Aug. 4-6 in Pleasant Prairie, WI at the USA Swimming Central Zones meet. Results from the State meet for our local swimmers are listed below.